I love a glass (or two) of bubbles and as a firm believer in the adage that life is too short to drink bad wine, my first preference is top shelf. As is the way of life though my budget severely limits my consumption of vintage French Champagne. All is not lost because we make some ripper drops here in Australia too, the best, in my opinion, coming out of Tasmania. In the interest of minimizing our waste from Christmas celebrations, I turned the dregs from a bottle of reasonably priced Champagne into a delicious dessert. It was super simple and very sophisticated. Kids might not like the flavour, but as the champagne has been boiled it’s alcohol free. It doesn’t matter if the wine is warm, or has lost it’s bubbles, it doesn’t matter if it’s not top shelf quality, it will still make a delicious jelly. You can see that with the simple addition of a single spoonful of raspberry compote this jelly is a very grown up dessert. Put the champagne and sugar into a small pot over a low heat and stir until the sugar has dissolved. Raise the heat and bring the champagne to the boil. Add the softened gelatine sheets one at a time swirling the champagne to melt and incorporate the gelatine. 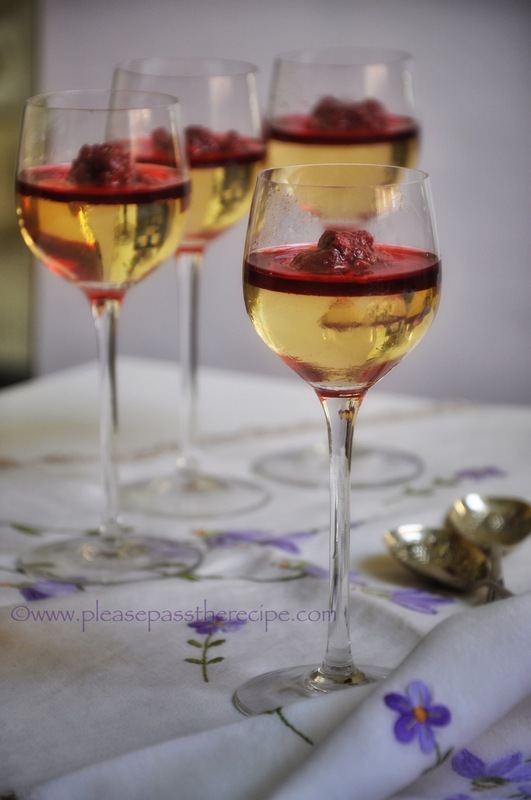 Divide the champagne jelly into four serving glasses. Allow to cool uncovered before refrigerating until set. Warm the raspberries and sugar over a low heat until the sugar has dissolved. Avoid stirring the raspberries to keep them intact. Chill until ready to serve. To serve, top each jelly with a generous spoonful of raspberry compote. Ohhh these look lovely. I’m not able to drink alcohol anymore, but these would be great for when friends come over. I have a friend who loves champagne so much she had champagne Friday every week. I think she would love this champagne jelly. I’ve pretty much had it with jam-making these past few days. Christmas gifts, you know. I should be back to normal just about the time that champagne bottles start popping. This year, however, I’m going to steal away a half-bottle or so. This is one jelly I need to make. Cheers! I sometimes have leftovers so this would be great! I love putting bubbly in jams already so I’m sure this would be a delicious dessert. Those look gorgeous Sandra! We never have leftover champers tho! Just on the off chance…. Lovely. No waste at all. I haven’t often notcied any dregs left in my Champagne bottles but it’s worth opening a bottom shelf number for this lovely jelly. In my next life, I want you to be my cook. I’m with you on life is too short…..and also on the fact that my budget stymies this!! This entry was posted on December 17, 2015 by ladyredspecs in Dairy Free, Desserts, FODMAP diet, Food, Fruit Desserts, Gluten Free, Lactose Free, Light dessert and tagged champagne, champagne jelly, dessert, FODMAP diet, gluten free dessert, lactose free dessert, raspberries.